Who doesn’t know about Joo Ji-Hoon’s comeback drama Five Fingers? I think everyone has to know about this, considering the fact that it’s the first time he’s appearing on the small screen since 2007. I heard about the drama for quite a while before the cast was confirmed but I wasn’t thinking about following the drama closely because of the length. It was slated for 50 episodes and I never had faith in myself when it comes to dramas with more than 20 episodes, except for a few. However, after watching the teaser, I couldn’t help but been captivated by the simple yet beautiful teaser. Not just because of that; another reason is the actual number of episodes turns out to be 30. So, why don’t I give it a try? God, I love it. This is surely a pure makjang, complete with all the elements needed for a makjang drama: dreams, tragedies, families, and of course, talent. Plus, all four main characters can play the piano! 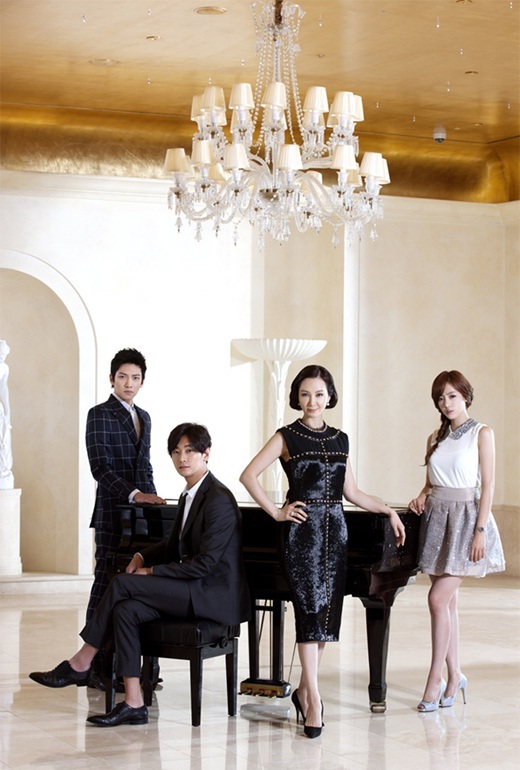 Wow…this is probably going to be a great drama filled with conflicts and music.Who won’t love some piano here and there? Five Fingers tells a story about aspiring young people achieving their dreams despite the challenges and tragedies in their lives. Yoo Ji-Sang (Joo Ji-Hoon) is a gifted pianist but experienced a tragic family history. As usual, if we have this talented guy, we must have his enemy who’s not that gifted. The said enemy is Yoo In-Ha (Ji Chang-Wook), Ji-Sang’s younger brother who’s jealous of his talent. The brothers are sons of Chae Young-Ran (Chae Si-Ra), the owner of Booyoung, a musical instrument company. So that makes them the chaebols. Come Hong Da-Mi (Ham Eunjung), a girl who has to give up her dream of being a pianist and end up juggling few jobs at a time to earn her living and her rival Jung So-Yeol (Lee Hae-In). Dreams and rivals, families and tragedies. The same ingredients being used over and over again for a drama full of conflicts, but these are also the things that make the journey of a drama more meaningful and heartwarming. I am looking forward to the drama, since the supporting cast is no joke: Jeon Mi-Sun (favorite! ), Jo Min-Ki, Jung Eun-Woo, just to name a few. The main cast just had their poster shooting, and the pictures are gorgeous. They’re not the official posters yet, but they have the power to attract people’s attention to the drama. Awesome! I prefer those stills with Chae Si-Ra in her red dress, because everyone looks so sharp and gorgeous. 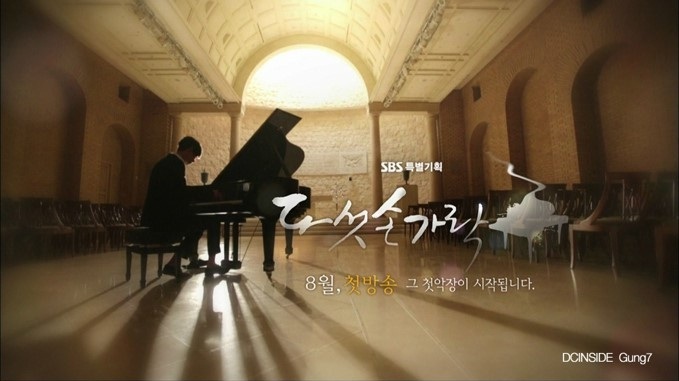 I hope to see one or two piano concertos in the drama (more is always welcomed) and of course, anticipating Joo Ji-Hoon’s first role after his military service. I’m sure Chae Si-Ra will shine too this time, and I’m looking forward to Eunjung and Ji Chang-Wook’s portrayals of their characters. Directed by Choi Hyung-Hun and script written by Kim Sun-Ok, Five Fingers will take over the Sat-Sun slots from A Gentleman’s Dignity on SBS. Nothing has been confirmed about the broadcast date since SBS is planning to push the broadcast to a future date because of the Olympics. The only thing that we can do at this moment is to wait. Oh, let me try to make myself calm. I’m trying to accept Ji-Hoon’s new hairstyle, which still looks odd for him…and hopefully I can get used to it. Hopefully.